How well do you know Gettysburg’s Civil War history? 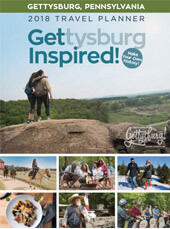 In the past 155 years, millions of visitors have walked the battlegrounds at Gettysburg, learning details and stories about the epic Civil War battle and reflecting on the poignant time in American history. Over that same time, thousands of books have been written, millions of artifacts have been archived and diary passages have been recited throughout the country – all in an effort to better understand this war. It’s that time of year again when school starts up for children around the country, including the estimated 1.5 million homeschool students that not only get their first glimpses of their curriculum and homework assignments, but to plan field trips that bring their studies to life. Gettysburg and the surrounding countryside is an amazing outdoor classroom. With the iconic Civil War battlefield, hands-on museums and tours, as well as a unique farming community, homeschool field trips to the region are an amazing way to learn about a variety of subjects. By Cory Runk – Have you ever wondered if Gettysburg houses artifacts that can’t be seen anywhere else? Artifacts so interesting that it gives you chills just listening to the story behind it? Historical items which the likes of President Lincoln, President Eisenhower, Thaddeus Stevens and many others have owned or used in their everyday life are located in Gettysburg – have you seen them?